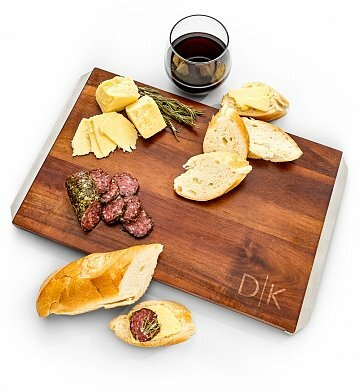 Ideal for fine aged cheeses, hearty breads, fruit and charcuterie, this 100% acacia cheese board makes the perfect housewarming gift, especially with complimentary engraving of your chosen initials. Solid acacia wood with a lustrous dark finish and two stainless steel slat handles on the sides achieve a modern, contemporary look and feel. One Viski Acacia Cheese Board with Slat Handles. Complimentary Engraving on Acacia Board Surface. Free Engraving! Select two initials to be engraved on acacia surface. Enter information to be engraved using the personalization option during checkout. Engraved Serving Board is a hand delivered gift. These gifts are delivered by one of our local design centers located throughout the United States and Canada. Same day delivery is available for most gifts when ordered before the cutoff time. The cutoff time for Engraved Serving Board is 1 PM in the recipient's time zone. Complimentary engraving of your chosen initials on acacia surface.